At left, Mildred Thomson, wife of the late Rev. Paul van K. Thomson ’86Hon., is shown with, from left, Michael M. Woody ’77 & ’83G, chair of the Liberal Arts Honors Program Leadership Council, her granddaughter Margaret Cotter Pouliot ’97, and her daughters, Monica Thomson Markarian and Madeleine Thomson Cotter ’75. At right are, from left, College President Rev. Brian J. Shanley, O.P. ’80; Dr. Stephen J. Lynch, director of the Liberal Arts Honors Program; Dr. Hugh F. Lena, provost and senior vice president for academic affairs; and John J. Partridge ’61 & ’11Hon., a founding chair of the Liberal Arts Honors Program Leadership Council. A walkway between Harkins Hall and Phillips Memorial Library was named Thomson Way in honor of the late Rev. 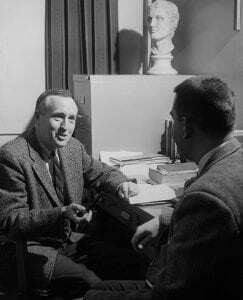 Paul van K. Thomson ’86Hon., a beloved Providence College professor who was the first director of the Liberal Arts Honors Program and helped to establish the Development of Western Civilization Program. Thomson Way was named at the request of Dr. Charles J. Goetz ’61 & ’12Hon., the Joseph M. Hartfield Professor of Law Emeritus at the University of Virginia School of Law, and his wife, Judith Condon Goetz. 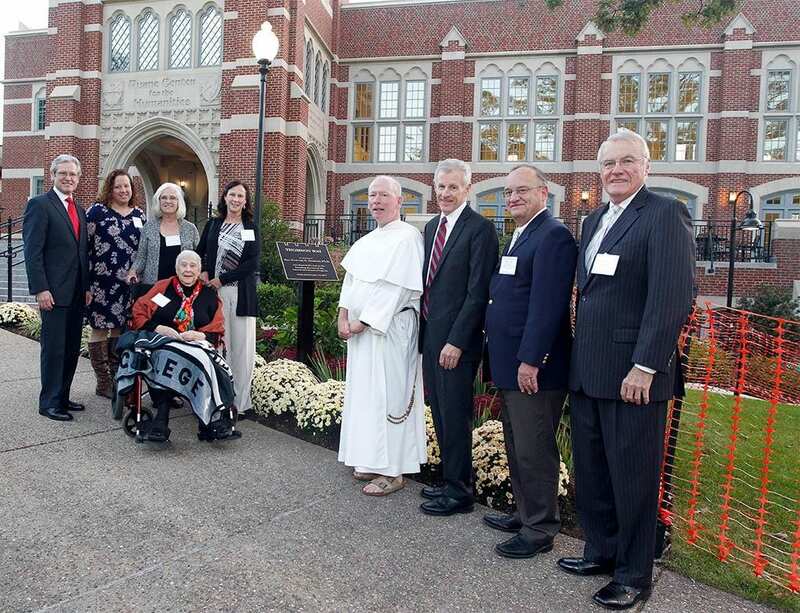 Goetz was unable to attend the dedication on Oct. 13 but provided a reflection that was read by his classmate, John J. Partridge ’61 & ’11Hon., a founding chair of the Liberal Arts Honors Program Leadership Council. After graduating from PC, Goetz earned a Ph.D. in economics from the University of Virginia, then taught at Virginia Tech before returning to the University of Virginia as the first non-lawyer to teach in the law school. The sign marking Thomson Way stands outside the Ruane Center for the Humanities, home of the Liberal Arts Honors Program and the Development of Western Civilization Program. 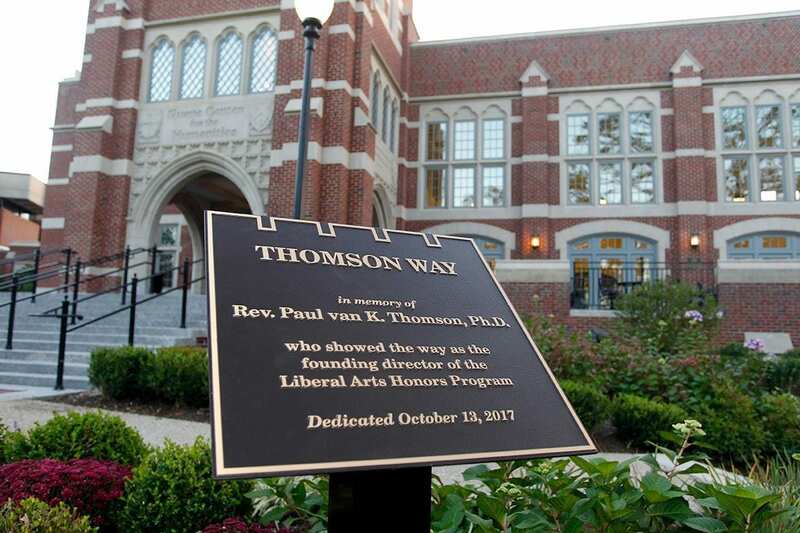 The dedication of Thomson Way took place outside the Ruane Center for the Humanities, which opened in 2013 as home to the DWC Program and the Liberal Arts Honors Program. Dr. Stephen J. Lynch, professor of English and Honors Program director, recognized Goetz’s support for the program and the Thomson Fund, which provides enrichment experiences for honors students. College President Rev. Brian J. Shanley, O.P. ’80, who blessed the walkway, described Father Thomson’s “enormous impact” on the College, especially as a teacher. As an administrator, he oversaw the introduction of women to campus in 1971 and the recruitment of faculty, he added. Rev. Paul van K. Thomson in a photo from the Providence College archives. 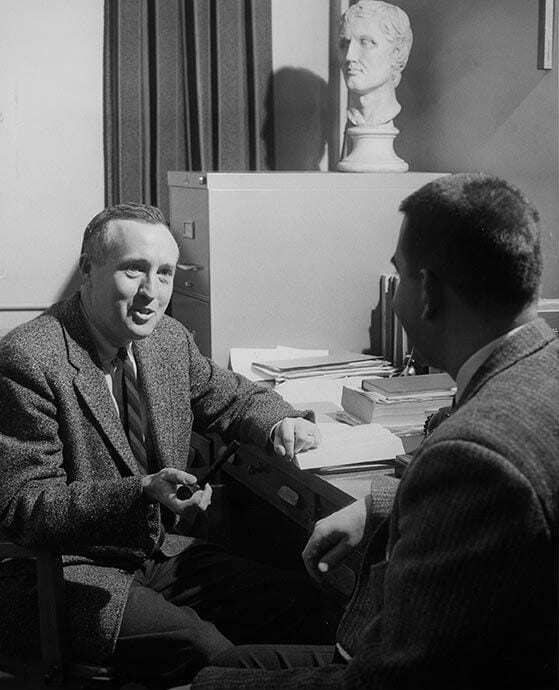 Father Thomson was a 1937 graduate of Columbia University, where a program in the “great books” inspired him to propose a Western Civilization colloquium when he became the first Honors Program director at PC in 1957. Father Thomson was ordained an Episcopal priest in 1940, converted to Catholicism in 1949, and became a Catholic priest in 1983 — only the sixth married man to be ordained under a pastoral provision by Pope John Paul II. Father Thomson joined the PC faculty in 1949 following service as a Navy chaplain with the Marines in the Pacific during World War II. He later earned a Ph.D. in English from Brown University. He served as PC’s vice president for academic administration from 1965-1982 and taught full time until his retirement in 1985, when he was named professor emeritus of English. He died in 1999 at age 83. Father Thomson and his wife, Mildred, were the parents of seven, including Madeline Thomson Cotter ’75, Peter Thomson ’77, and the late Jane Thomson ’79 & ’80G. Four of their grandchildren — the children of Madeline Thomson Cotter ’75 and her husband, Peter Cotter ’74 — also are alumni: Margaret Cotter Pouliot ’97, Peter Cotter ’99, Paul Cotter ’06, and Emily Cotter ’13. Mildred Thomson attended the dedication with Madeline and Peter Cotter, Pouliot, and another daughter, Monica Thomson Markarian. 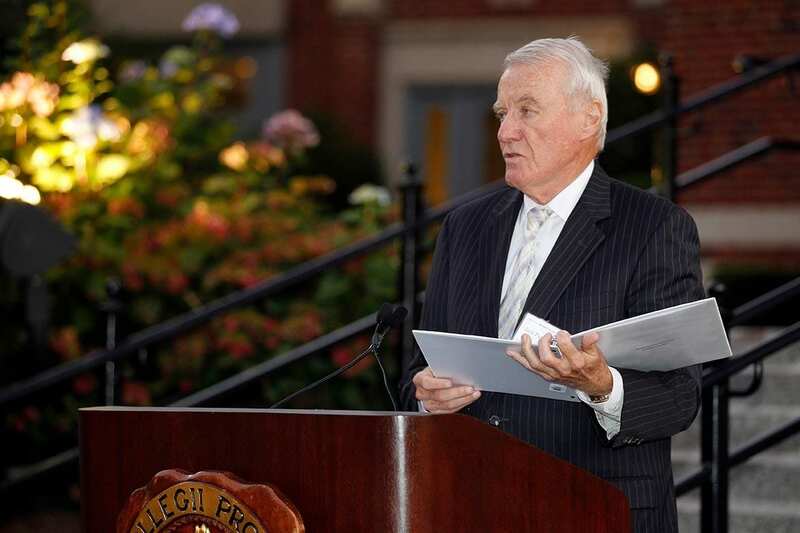 John J. Partridge ’61 & ’11Hon., a founding chair of the Liberal Arts Honors Program Leadership Council, reads remarks by Dr. Charles J. Goetz ’61 & ’12Hon., whose gift made the walkway possible. Following the dedication program, the annual Liberal Arts Honors Convocation took place in Slavin Center ’64 Hall, with pediatrician Laurie Malia, D.O. ’07 as the keynote speaker. Malia is a doctor of osteopathy and a fellow of the American Academy of Pediatricians with board certification in pediatrics. She graduated from the Virginia College of Osteopathic Medicine and trained at the Children’s Medical Center at the University of Connecticut. She has been the recipient of numerous honors and awards, including an American Association of University Women Scholarship and a Distinguished Scholar Award. She is now completing a fellowship in pediatric emergency medicine at UConn’s School of Medicine. Also during the convocation dinner, Nicholas Ogrinc ’19 (Lebanon, N.H.) received the Rev. Paul van K. Thomson Award, presented to the best student to complete the two-year Honors DWC Program. John Murphy ’20 (Brunswick, Maine) received the Rodney K. Delasanta Award, given for the best essay in first-year Honors DWC.